Dairy goats need a year-round supply of roughage, such as pasture, browse or well-cured hay. Winter browse and pastures should be supplemented with hay. Milking, breeding and growing stock need a daily portion of legume hay, such as alfalfa. Kids and bucks need a balanced grain ration and milkers should be fed a standard dairy grain ration. Kids are milk fed until two to three months of age, but should be consuming forages such as pasture grass or hay by two weeks of age and grain within four. All dairy goats must have salt and fresh clean water. Mineral supplements are desirable. Dairy goats have fastidious eating habits and are particular about the cleanliness of their food. Their natural curiosity may lead them to investigate newly found items by sniffing and nibbling, but they quickly refuse anything that is dirty or distasteful. Dairy goats will graze grass pastures, but prefer to browse brushlands and a varied selection of pasture plants, including non-noxious weeds. Dairy goats seldom thrive when tethered. They may be kept in a dry lot if fed adequate roughage and allowed shade and space for exercise. Dairy goats are curious and agile and require well built fences for containment and protection from predators. In temperate climates, one-half acre of land per milking goat should be plenty. Under arid conditions, people must guard against the danger of overgrazing. Overstocking in temperate climates is also bad for goats, since it increases reinfestation of internal parasites. Rotational pasturing is one of the successful controls. Dairy goats are kept successfully in all climates. They do not need elaborate housing, but do require clean, dry, well ventilated, draft free shelter. Dirt pen floors are preferred over cement. At least 15 square feet of bedded area should be provided for each goat. The outside exercise lot should provide a minimum of 25 square feet of space per animal, well-drained and properly fenced. Dairy goats have a strong herd instinct and prefer the companionship of at least one other goat. Bucks should be kept in separate quarters away from milking does. Ideally, goats should be dehorned when they are very young. It is advisable to wait until they are 1-2 weeks of age and in good flesh to be sure they are healthy and not coming down with neonatal diarrhea. If discolored skin is fixed to the skull in two rosettes, horn buds are present. Moveable skin indicates a naturally hornless condition. Hooves should be trimmed frequently to assure proper development of the hoof. To check the health of goats and determine suspected illness, it is useful to know their normal physiological values. Pulse is about 83 per minute ranging from 50 to 115. Respiration is around 29 per minute with a range from 15 to 50. Body temperature is about 103.6 degrees Fahrenheit. Keeping good weight records is important for proper feeding and medication, besides good management. Tapes can be used for estimation of weight by measuring the heart girth behind the forelegs. There also exists normal growth curve to age-weight relationships. For large breed male goats, they are in average as follows: 1 month-25 lb., 3 months-55 lb., 6 months-85 lb., 9 months-110 lb., 12 months-130 lb., 18 months-155 lb., 24 months-170 lb., 36 months-205 lb. For smaller breeds and females, these standards are less, proportionate to the lesser adult body weight. 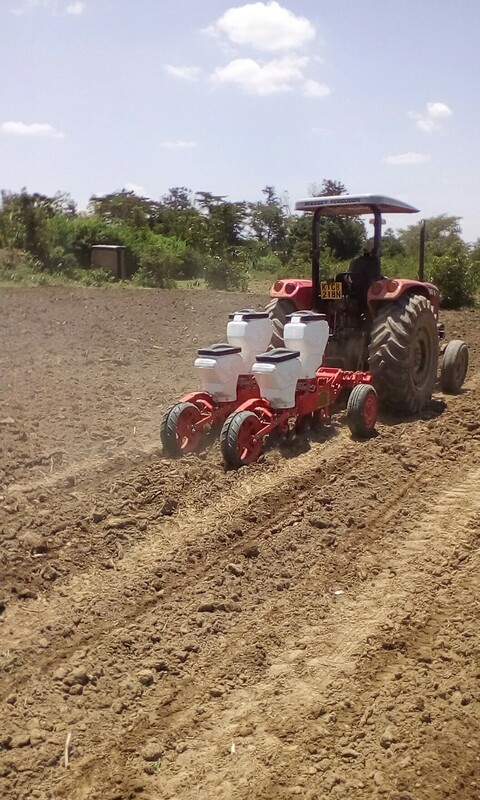 Precision seed drills for small farms- designed to work in conventional or mini-till conditions, especially suitable for large seeds distributed by discs. Auger and rotative axle for fertilizer distribution-fertilizer placement: openers or offset double disc- connected to tractor via hydraulic arms and 3-point linkage. Manual row markers and 50 litres seed hopper and 60 litres fertilizer hopper capacity for each row. Simple and strong frame with only one metal beam: easy mounting and different row spacings possible.